This week I traveled to Hershey, Pennsylvania to scout some properties for the 2019 Pellet Fuels Institute Annual Conference. Hershey was delightful and the incredible story of Milton Hershey and the chocolate empire he built is impressive. Still, the work PFI Conference Committee Chair Kenny Lisle and I did for next year's conference paled in comparison to the whistle-stop tour through the entire pellet heating supply chain we managed to fit in around our conference scouting mission. Energex's production facility in nearby Mifflintown keeps Kenny well-connected to the broader wood heat segment in the region. I was fortunate enough in two short days-to visit a hearth retailer in the area, Energex's plant in Mifflintown, and PFI member, Hearth & Home Technologies manufacturing plant in Halifax, Pennsylvania. Building Up Some Inventory: The Energex production facility in Mifflintown is busy building out some inventory in anticipation of an upcoming heating season that shows signs of a return to high heating oil prices. Our first stop was North Forge Hearth Store just down the road from Hershey, a retail location Kenny described as "top-notch." Situated on the outskirts of town, Barry Burkey's store is without question the most extensive specialty hearth retail location I've ever been to. Just after lunch on Tuesday, the store was relatively quiet, offering me a chance to speak at length with Barry. With nearly four decades of experience selling heating appliances, it is fair to say that Barry has seen it all. I asked Barry about his recent pellet appliance sales and his response echoed what so many of us already know. That said, Barry didn't seem particularly concerned, explaining that being in the business as long as he has hardens a person to the inevitable ups and downs of the wood heat market. The man is a living encyclopedia of the history of pellet appliances manufactured and sold in the country, offering stories of the first appliances he bought and sold in the early 80's. It came as no surprise to me that barbecue appliances took center stage in Barry's shop. On Saturdays, Barry fires up a pellet grill/smoker built into a handsome outdoor kitchen he's built in front of his shop and the smoke and aroma do a great job of bringing in curious customers. BBQ Season in PA: (L to R) Barry Burkey, owner of North Forge Heating and Kenny Lisle of Energex talk BBQ season and how live cooking demos bring customers into the store. On Wednesday morning, Kenny and I made the short drive to Halifax where many of the appliances featured, so prominently, in Barry's shop are manufactured. While I've visited many pellet plants in my time covering this industry, my experience with appliance manufacturing is relatively light. In fact, my visit to the Halifax facility was my first look at appliance manufacturing in the U.S. I wasn't disappointed. By every measure, Hearth & Home Technology's plant in Halifax is impressive. While walking down the production lines and watching a completed appliance come together delivers a certain "wow" factor, I was most impressed by my guide, Ian Johnson. Raised in the area, Ian studied manufacturing engineering at Lehigh University and he offered detailed explanations of what was happening throughout the manufacturing process. I learned more in 10 minutes talking to him about combustion dynamics and emissions than I've learned in 10 years covering the industry. On our way out, I met Corie Podschelne. We chatted just long enough for me to ask him how he got into the business and I'm not sure why I was surprised to hear that he went to school with the hopes of designing wood heat appliances. It caught me flat-footed because so often the responses I get to that question leads to stories of twisting and turning career pathways that ultimately land people in our space. 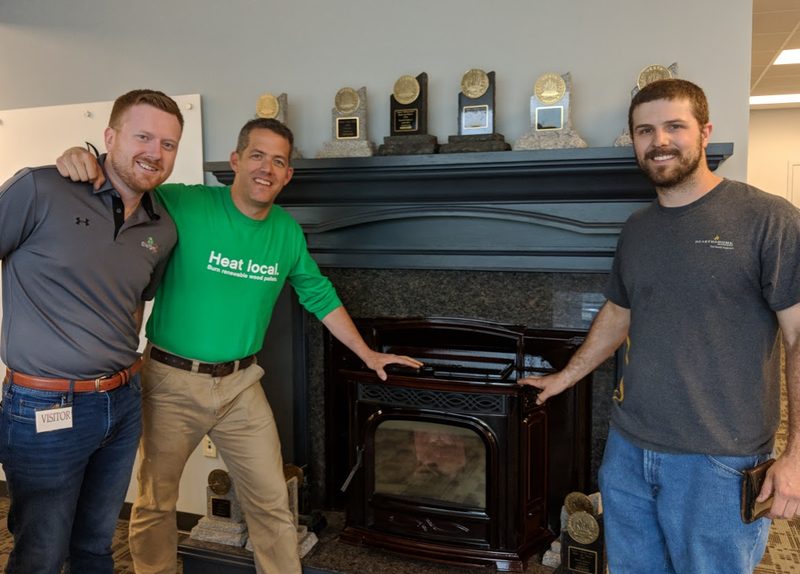 Award Winning Appliances: (L to R) Kenny Lisle, Energex; Tim Portz, Pellet Fuels Institute, and Ian Johnson, Hearth, and Home Technologies pose with a Harman Accentra in the offices of Hearth & Home Technologies manufacturing facility in Halifax, Pennsylvania. Finally, I'd be remiss if I didn't mention how gratifying it was to be amongst people who fabricate things for a living. 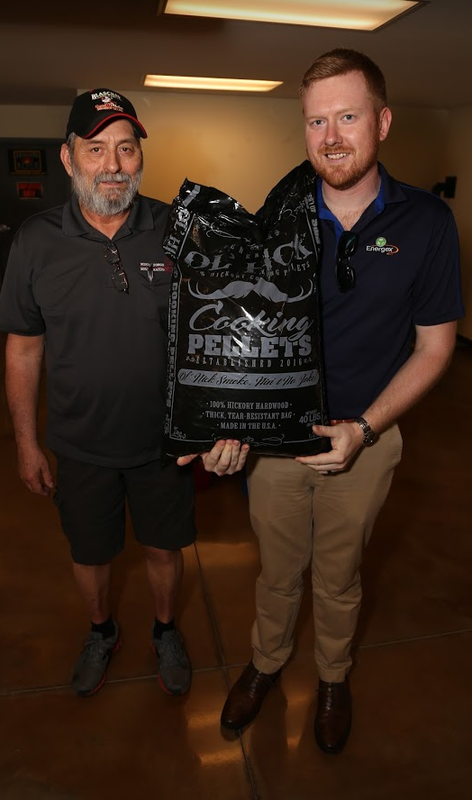 In one of my earliest columns for the Pellet Wire, I cited a passion for American manufacturing as one of the key reasons for my interest in taking on the role of Executive Director at the Pellet Fuels Institute. Our industry puts people to work and that is the noblest of causes and one that cannot be underscored enough. While we still have some details to work out with Hershey before we can announce it as the venue for the 2019 conference, I'm excited about the prospect of bringing the industry together there as I'm returning home as refreshed and excited about our industry as I have been in a long, long time. Only 5 Weeks Till the PFI Annual Conference in Myrtle Beach! Attending the PFI Annual Conference is an important way to show your support for our trade association and for the pellet fuels industry. We hope to see you in Myrtle Beach next month (June 24-26) - only five weeks away! Hotel rooms are filling up quickly so be sure to book soon! We're building a collection of photos of our members, their pellets mills, and product. Send them to Carrie Annand at [email protected]. 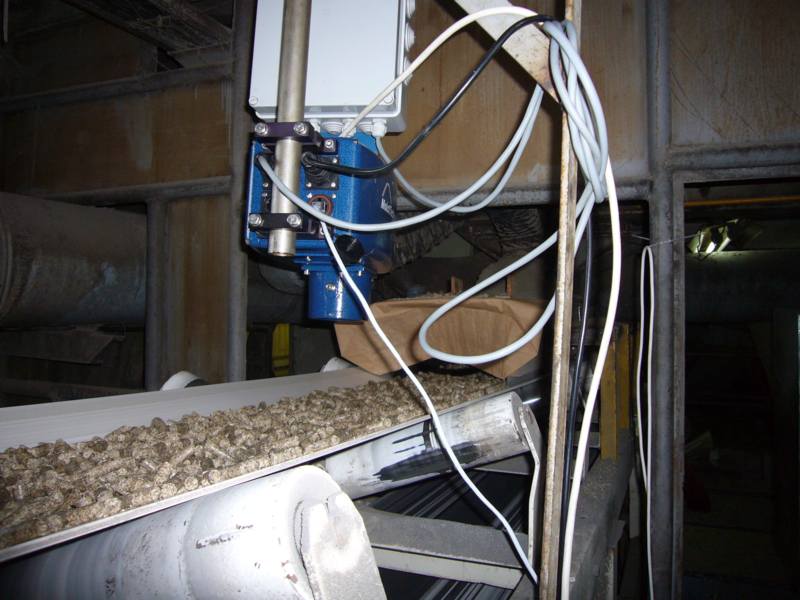 This week's featured photo, of pellets on a conveyor belt to take a measurement of moisture content, is from Sarah Hammond with MoistTech. Rod Bouchard, county project manager, said the county considered different ways to replace the nursing home's old oil-steam system before landing on the biomass boiler. "We looked at propane, and we looked at woodchips, and we looked at a bunch of other alternatives out there," he said. "And the option that had the very best payback was a green woodchip boiler." The biomass boiler is expected to save $163,490 in energy costs per year compared to propane, for savings of nearly $3.3 million over the system's 20-year lifespan, Bansley said in a news release Friday. The boiler is just one of several ways the renovations will make Maplewood more energy efficient, including improved insulation and windows that let less air out, Bouchard said. The money for the boiler comes from the Renewable Energy Fund, administered by the N.H. Public Utilities Commission. 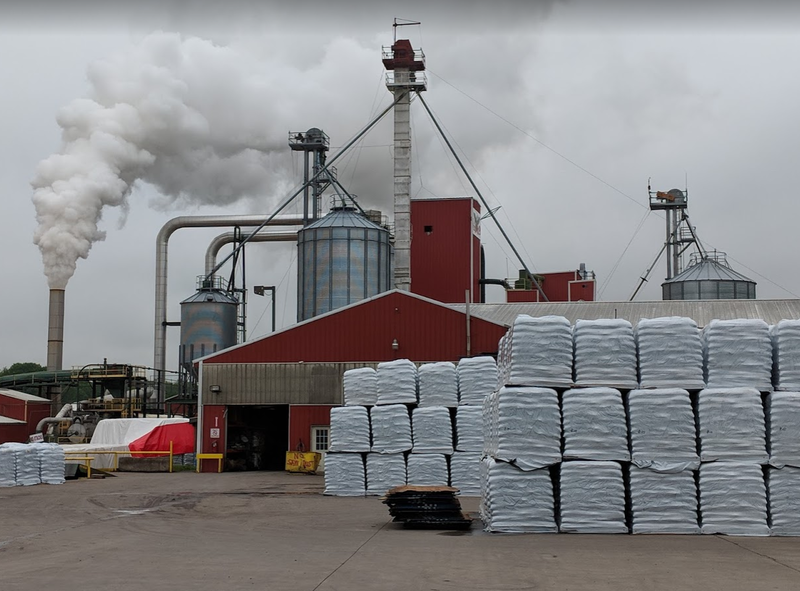 Local startup Biothermic had an exciting day on Thursday, launching its first wood-pellet delivery service in Thunder Bay. The homegrown company is pioneering a form of high-efficiency, central wood-pellet heating system in various locations across Canada. The heating system offers a cost-efficient, and enviro-friendly alternative to propane, heating oil, and electricity. "Wood pellets have a big potential for growth," Biothermic president Vince Rutter said. On Wednesday, the provincial government announced it would fund wood heat pilot programs in Sioux Lookout, Wawa and seven northern Ontario First Nations. On May 10, California Gov. Jerry Brown issued an executive order that aims to protect communities from wildfire and climate impacts. The California Biomass Energy Alliance said it is encouraged that Brown recognizes the importance of biomass energy. Executive Order B-52-18 was issued in the face of the worst wildfires in California's history. It aims to combat dangerous tree morality, increase the ability of the state's forests to capture carbon, and systematically improve forest management. "Devastating forest fires are a profound challenge to California," Brown said. "I intend to mobilize the resources of the state to protect our forests and ensure they absorb carbon to the maximum degree." One component of the executive order directs the California Public Utilities Commission to "review and update its procurement programs for small bioenergy renewable generators to ensure long-term programmatic certainty for investor-owned utilities and project developers, as well as benefits to ratepayers."